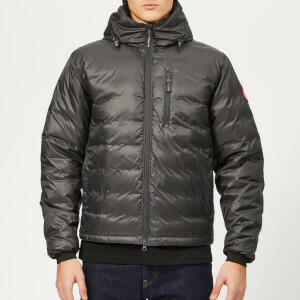 Men’s packable ‘Lodge’ jacket from experts in extreme weather outerwear, Canada Goose. Designed for core warmth, comfort and versatility, the water-resistant and windproof jacket offers warmth and element protection with a down-filled stand collar and two-way zip fastening with a protective storm flap underneath. 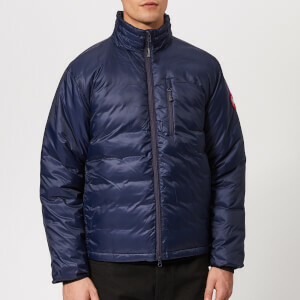 Constructed with a nylon ripstop shell, the slim-fit down jacket is built for optimum insulation with adjustable bungee cords on the collar and hem, along with elasticated Power Stretch® cuffs, to trap valuable body heat. Multiple pockets, including a vertical breast pocket, side hand-warmers and interior mesh drop-in slip, provide secure and easily accessible storage for essentials. Detailed with a tricot fabric-lined chin guard for comfort and an embroidered logo badge on the left arm. 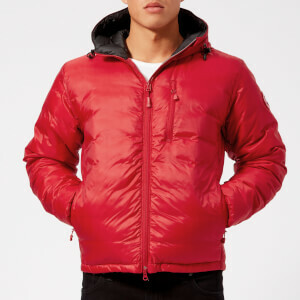 Packs into the right interior zipper pocket for easy storage in unpredictable weather and doubles as a travel pillow. 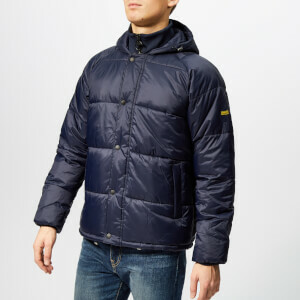 Ideal for freezing temperatures (0°C / -15°C), the jacket falls under the brand’s ‘Versatile’ category (TEI2) on the Thermal Experience Index. Shell: 100% Nylon. Lining/Padding: 100% Polyester. Fill: 750 Fill Power Hutterite White Duck Down. CHEST inches 32"-33" 34"-35" 36"-37" 38"-40" 41"-43" 44"-46" 47"-51" 52"-56"
WAIST inches 25"-26" 27"-28" 29"-30" 31"-33" 34"-36" 37"-39" 40"-44" 45"-49"
HIPS inches 32"-33" 34"-35" 36"-37" 38"-40" 41"-43" 44"-46" 47"-51" 52"-56"